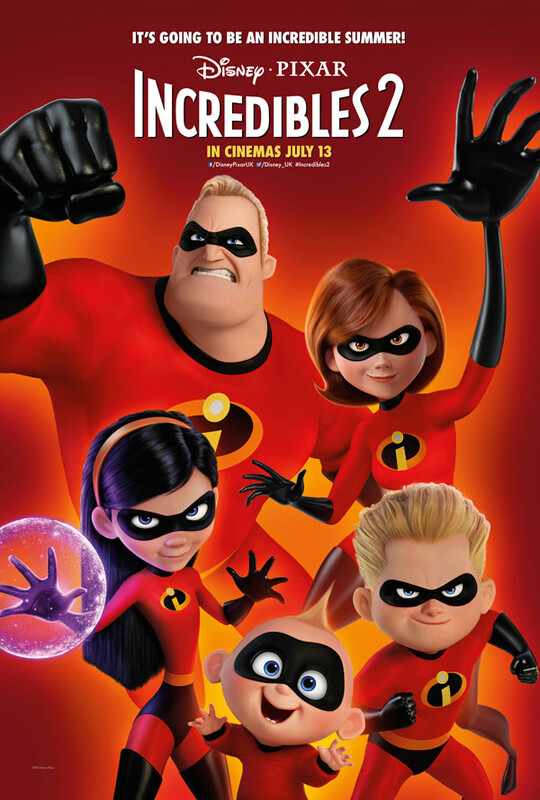 Incredibles 2 is certainly one of the most anticipated animated films in recent times - it's been fourteen years since the original impressed us and left us dying for a follow up, and it's clear by this sequel's box office records that said hype has indeed been lived up to on a financial level. Critics are equally impressed - but is all this acclaim truly deserved? It seems most audiences would agree, but I find myself rather unsure, despite being both a huge fan of Pixar and of course the original film itself. Incredibles 2 follows directly on from the original as the titular heroes fight off the villainous Underminer (John Ratzenberger), only to generate further controversy following all the destruction done in the process; however, they eventually find themselves approached Winston Deavor (Bob Odenkirk), owner of DevTech, who seeks a way to restore superheroes' former glory amongst the general public. His schemes are initially helmed by Elastigirl (Holly Hunter), who ventures on a series of missions to demonstrate the unseen potential superheroes truly have once more, soon bringing her face to face with a mysterious new foe known simply as the Screenslaver. The Incredibles stood out amongst the animated genre upon release for many reasons, though one such reason was it's thoughtful story that blended together a lot of complex themes and ideas; so it's a shame this long awaited sequel doesn't really live up to that level of quality, and certainly not the immense expectations behind it. Perhaps the biggest issue is simply the structure of the story itself - Elastigirl is primarily the star of the show this time round, and while she certainly helms a lot of gripping and superbly choreographed set pieces, it's a shame the former greatness of Mr. Incredible (Craig T. Nelson) is long gone, with him now stuck in the role of an overworked babysitter, struggling to understand Dash's (Huck Milner) strangely complicated homework, Violet's (Sarah Vowell) teenage emotional turmoil, and of course the insanely repetitive chaos involving Jack-Jack's handful of newly developed powers. As a result of these awkward jumps between Elastigirl's heroisms and Mr. Incredible's disastrous babysitting, the plot in general is just fairly shallow - with a dull villain and somewhat predictable plot twist as we approach the climax. On the flipside, the final fight itself is perhaps one of the films' best moments, blending the antics of all kinds of heroes into a creative climactic battle - I only wish this was a bit more regular, instead of having most heroes jammed into roles that are essentially borderline comic relief. Incredibles 2 is a decent film, boasting beautiful animation and a plethora of gripping set pieces, but it also just feels unfocused and excessively silly; too often I felt like I was watching some sort of parody of the genre, and not the near masterpiece almost everyone else believes it to be.